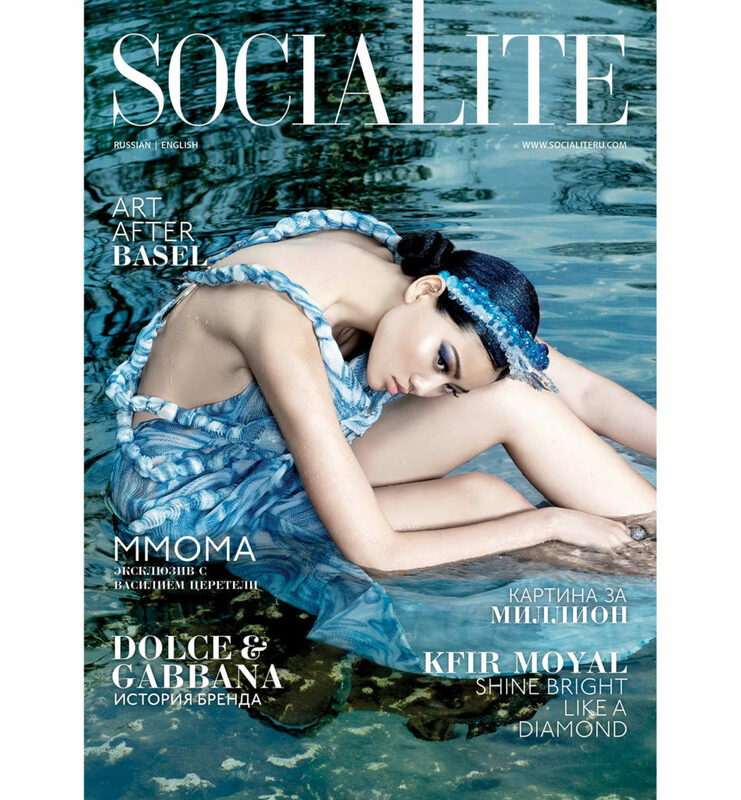 Coveted cover of the Art Basel issue of Socialite Magazine with ZulaStudio design shot by Natasha Kertes – famous artist well known for her sensual and refined approach to the subjective concept of beauty. In the ocean of the online media spoiled by the avalanche of talent, submitting works from all over the world through the gates opened by The Net, and in the era when fashion ceased dictating rules, how do you justify what is truly beautiful? Do we have a detailed list of the ingredients for the magical potion in some text book? Is there a math formula that could analyze the curve of the rose petal or the flight of the butterfly? Would we admire it less, will it lessen our awe if it were in fact an actual formula and anybody could avail by working hard and studying? It seams to me, that the magic happens when you’re on the path in the dark forest, where you’re being led by your artistic intuition and insatiable thirst for harmony and love. You see the light, you make a step, you move between dimensions and senses to pursue this subtle, vague, clandestine feeling that you just momentarily trapped the light, the moment, the form. Strong certitude of the finality, the perfection, the end of journey that doesn’t require explanations, proofs or, indeed, any formula. Just take a cauldron filled with educated experience, add inspiration and defined concept, don’t forget the input of the team of skilled professionals, pour a bit of pain, a lot of sweat, some laughter, a handful of humor, and some luck. Sprinkle this all with Love. And oh, don’t forget a pinch of insanity. After all, what is Magic without a trip to the other side of the Mind? What a marvelous writing !!!!! Magic transcended indeed. My genius soul you, Zula. So splendid!!!! Thank you! Out of the whole shoot, this image alone worth every drop of sweat and tear of joy, you truly conjured magical piece of Art here!